After the Bmdila incident, Army atrocities now reported from Longding, where they beaten 32 villagers including a priest and former GPM. After the incident of rampage by Arunachal Scout in Bomdila, now a report coming from Longkhjon village of Longding District where 23 villagers along with a Priest namely Lempo Angjen and former GPM Ramgkai Apesam were beaten up by army men for reasons which the villagers were completely ignorant. As per the report, on the 14th November, 2018, a group of militants brought a dead body of an underground cadre and asked the villagers under gun point to carry the dead body to Ronghua village . The innocent villagers for the sake of their lives had to carry the body of the dead militant but had no connection with the underground. In this connection, a case vides KBR PS Case Nov14/2018 u/s 302 IPC have been registered on November 15, 2018. It is reported that army personnel from Dhangri, Assam led by Captain Mahapatra on November 18, 2018 arrived at Longkhojan village, Longding District at around 7 pm and started search operation without informing the village chief and Gaon Bura. The search operation was not accompanied by civil police. Soon the adult male members of the village were asked to gather at the general ground for inquiry. The villagers have alleged that the army personnel on duty have mistreated them. Harsh and unparliamentarily words were used against men and women, altogether 23 persons were reportedly detained in the general ground the whole cold night without food, water and warm clothes. The Wancho Council (WC), Wancho Students’ Union (WSU), Longding District Students’ Union (LDSU) and All Wancho Women Welfare Society (AWWWS), in a joint press statement to the Deputy Commissioner, Longding condemned the brutal act of Army Jawan in its strongest term. 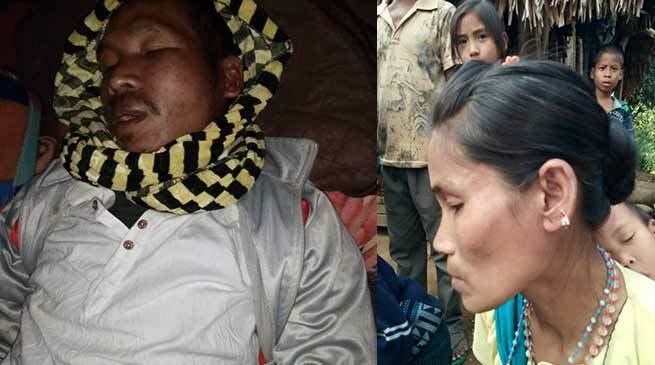 “Former Longkhojan GPM Rankai Apesam and Longkhojan Baptist church pastor Lempo Wangjen were beaten with lathis and received injuries, while a woman was also said to have been beaten up by the army personnel and received minor injury,” it added. Member of Parliament Ninong Ering also wrote a latter to PM Modi and informed about the incident. Ering alleged in his latter ‘Prior to the operation, Army did not even inform the District Administration nor did they take any civil police with them. This is gross violation of human Rights’. Ering requested to PM Modi for his intervene in the matter and necessary action on those Army Personnel for the atrocities meted against the villagers of Longkhojan . As a citizen of India I would strongly support the press released from Longding, against the brutal act of an army man who actually is paid servant of Government which means my money. They are mean to protect our land,people but instead they act wild against civilian. Looking forward for the action to be taking against army personnel from Dangri Assam. A army is to protect us from the enemies and guards to our mother-land. not to harm a common civilians, a matter of fact this is against the law. I request there must be a quick action towards the guilty soldiers. I don’t understand why people of arunachal are making it to news all the time when they do the same thing with people of other parts of India. I am sure this is one sided story.